In the course of the second pre-Christian millennium, the ancient Greeks descended in several migratory waves from the interior of the Balkans to Greece. Some passed across the plain of Thessaly on their way south, while others went south through Epirus. More recent scholars point to Asia Minor as the original Greek homeland. There is no evidence that the ancient Greeks ever settled prehistoric Macedonia. Archeological evidence shows that ancient Macedonia lay beyond the cultural and ethnic borders of the Bronze Age Mycenaean Greek Civilization, which ends at the border of northern Thessaly (1400 - 1100 BC). The prehistoric Macedonians show a remarkable continuation of existing material culture. Ancient Macedonia was home to many tribes. The ancient Macedonian tribes emerged from the Brygians or Phrygians. Some of the Brygians left Macedonia and migrated to Asia Minor where they changed their name to Phrygians and established a powerful Phrygian kingdom (Herodotus). When the Macedonian army under Alexander the Great will enter Phrygia centuries later, Philotas spoke of the connections between the Phrygians and the Macedonians, by calling the Macedonians "Phrygians" (Curtius). Greek migrants settled few coastal areas of Macedonia, Thrace, and Illyria after they exhausted the possibilities of settlement in Asia Minor, Italy, France, Spain and Scythia (Ukraine and Russia). However, they did not consider Macedonia especially attractive for permanent settlement. Neither did the Macedonians welcome them as open-heartedly as did the Italians and Scythians. By the middle of the fourth century BC, the Greek settlers were expelled from Macedonia and their cities, including Aristotle's native Stragira, razed to the ground by the Macedonian king Philip II (360-336). Aristotle died in exile in Greece. The Macedonian "barbarian" defeated Greece at the battle of Chaeronea in August 338 BC and appointed himself "Commander of the Greeks". This battle had established Macedonian hegemony over Greece and this date is commonly taken as the end of Greek history and the beginning of the Macedonian era. Greece did not regain its independence until 1827 AD. In 335 BC, Philip's son Alexander campaigned toward the Danube, to secure Macedonia's northern frontier. On rumors of his death, a revolt broke out in Greece with the support of leading Athenians. Alexander marched south covering 240 miles in two weeks. When the revolt continued he sacked Thebes, killing 6,000 people and enslaving the survivors. Only the temples and the house of the poet Pindar were spared. The Macedonians spoke their own native language which was unrecognizable by the Greeks. The very label barbarian literally means a person who does not speak Greek. Though Alexander spoke also Greek, loved Homer, and respected his tutor Aristotle, there is much evidence that he hated the Greeks of his day, just like his father Philip II. Philip had razed to the ground the Greek cities on Macedonian territory (including all 32 Greek cities in Chalcidice) and enslaved their inhabitants. Alexander the Great thoroughly destroyed Thebes. His Asian empire has not once been described as "Greek", but is correctly called Macedonian for he won it with an army of 35,000 Macedonians and only 7,600 Greeks, and similar numbers of Thracians and Illyrians who were all forced to fight with their Macedonian overlords. The overwhelming number of Greeks however, 50,000 in total (Curtius), had however, distinguished themselves on the side of the Persians and fought fiercely till the end against the Macedonians. For instance, at the battle of Granicus there were 20,000 Greeks, out of which the Macedonians killed 18,000 and the 2,000 survivors were sent in chains to Macedonia (Arrian, Curtius). Arrian specifically speaks of the "old racial rivalry" between Macedonians and Greeks that characterized this battle. At the battle of Issus, there were 30,000 Greeks on the side of the Persians to fight Alexander, and their survivors also fought at Gaugamela along with the Albanians and the Persians, against the Macedonians. "The Macedonians are about to pass judgement upon you; I wish to know weather you will use their native tongue in addressing them." Philotas replied: "Besides the Macedonians there are many present who, I think, will more easily understand what I shell say if I use the same language which you have employed." Than said the king: "Do you not see how Philotas loathes even the language of his fatherland? For he alone disdains to learn it. But let him by all means speak in whatever way he desires, provided that you remember that he holds out customs in as much abhorrence as our language" (Curtius). Today's modern Macedonian language has both ancient Macedonian and Slavic background. How much modern Macedonian is based upon ancient Macedonian is impossible to say since we do not have many ancient Macedonian words that have survived, except about 150 glosses. Yet, ancient Macedonian words are still present in modern Macedonian. Alexander's infantry peshatairoi literally means "armed walking men" in modern Macedonian (peshatari). Hammond says that the ancient Macedonians called their commander tchelniku, which again means in modern Macedonian "somebody who leads" (chelniku). The Macedonian prodromoi, were the openers in the battles of Alexander the Great. Today in modern Macedonian this means "somebody who penetrates" (prodir), etc. Many ancient Macedonian names are still present among today's Macedonians, and many ancient Macedonian customs have the ancients have described have survived as well among today's Macedonians. The memory of Philip II and Alexander the Great echoes in the Macedonian folklore. In 1827, the European powers intervened on behalf of the Greek rebels and forced the Turks to grant them independence. The same powers, established the first modern Greek state, chose Prince Otto of Bavaria to be the "King of the Hellenes", and sent him to Athens. Serbia freed herself also from the Turkish rule, while Russia declared war on Turkey to help Bulgaria gain its independence. There were even Greek and Bulgarian writers to support what Karl Hron has written. One such example is the Bulgarian slavist and ethnographer P. Draganov, who in his studies of 1887-1894 and 1903, proved the existence of the Macedonians and the Macedonian language as a distinct language. Here is what Henry Brailsford had said about the Macedonians in "Macedonia: its Races and their Future". "Are the Macedonians Serbs or Bulgars? The question is constantly asked and dogmatically answered in Belgrade and Sofia. But the lesson of history is obviously that there is no answer at all. They are not Serbs, for their blood can hardly be purely Slavonic... On the other hand, they can hardly be Bulgarians... They are very probably very much what they were before either a Bulgarian or a Serbian Empire existed - a Slav people derived from various stocks, who invaded the peninsula at different periods." "... Next to the Ottoman government nothing can be more deplorable and blameworthy than jealousies between Greek and Slav and plans by the states already existing for appropriating other territory. Why not Macedonia for the Macedonians as well as Bulgaria for the Bulgarians and Serbia for the Serbians." Gladstone was three times elected Prime Minister of England (1868 -1874; 1880 - 1885 and 1893 - 1894). He supported the Macedonian nation in its quest for freedom. Perhaps Macedonia would have gained its independence had this man been once again elected Prime Minister during the big Ilinden Uprising on August 2, 1903. Left without any support, the uprising was crushed by the Turks, followed by the massacre on the innocent Macedonian population. 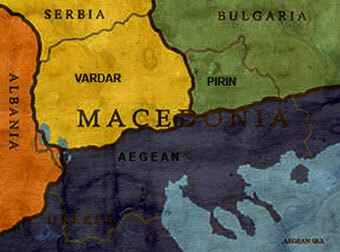 Greece was awarded Aegean Macedonia and renamed it to "Northern Greece"; Bulgaria annexed Pirin Macedonia and abolished the Macedonian name, and Serbia took over Vardar Macedonia and renamed it to "Southern Serbia".The same year, N. Pasich of Serbia and E. Venizelos of Greece agreed on the newly formed Greek-Serbian (later Yugoslavian) border, so that there would be "only Serbs to the North and only Greeks to the South", and no "Macedonians" on either side. Thus, the politics to assimilate the Macedonians of Aegean Macedonia had already begun. 1. On June 21, 22, and 23, 1913, the Greek army completely burned to the ground the city of Kukush (today Kilkis), known for its resistance against Hellenism in the XIX century and the birthplace of Gotse Delchev. 2. Between June 29 and 25, 39 villages in the Kukush area were also burned down. 3. On June 23 and 24, the city of Serres (today Serrai) was set on fire where 4000 houses perished. In the Serres gymnasium the Greeks murdered about 200 people. 4. During these days the larger portion of Strumica was also destroyed by the Greek army. 5. Between June 23 and 30, many villages in the Drama and Serres districts were burned down. 6. From June 27 to July 6 all Macedonian quarts of Salonika were set on fire. Since 1913, official Greece has been trying to banish native Macedonian names of villages, towns, cities, rivers, and lakes in Aegean Macedonia. For example, the little stream which issues from Mount Olympus and flows into the Aegean Sea is labeled Mavroneri ("black water") on the maps made by Greek cartographers after 1913. However, the same river appears as Crna Reka, a native Macedonian name meaning "black river" on the maps made before 1913. Kukush has been dropped for Kilkis and Serres for Serai, together with at least 300 other places all over Macedonia. The presence of the Macedonians in Aegean Macedonia could not allow Greece to claim that land to be Greek and only Greek. Since it was proven that they resisted the Hellenization, Greece decided to drive them out of Macedonia. Greece made agreements with Bulgaria (signed 10/27/19), and Turkey (1/30/23 in Lausanne), for exchange of population. This provided for the Macedonians of Aegean to leave for Bulgaria, while the Greeks in Bulgaria and Turkey settled in the Aegean part of Macedonia. These measures changed the ethnic character of the Aegean Macedonia. According to the "Great Greek Encyclopedia", there were 1,221,849 newcomers against 80,000 "slavophones". The "Ethnic Map of Greek Macedonia Showing the Ratio Between Various Ethnic Elements in 1912 and 1926," claims there were 119,000 "bulgarisants" in 1912, and 77,000 in 1926. The Greek ethnic map of Aegean Macedonia was submitted to the League of the nations by the Greek government. The League of the Nations had not visited Aegean Macedonia and did not participate at all in conducting this statistics. Greece here refers to the Macedonians as "bulgarisants", which means "those who pretend to be Bulgarians" and obviously non-Bulgarians. However, Greece uses many other names in falsifying the identity of the Macedonians. Slavophones, Slav Macedonians, Makedoslavs, Slav Greeks, and Bulgarisants, are only some of the names that prove Greece's unpreparess in this mean falsification of the Macedonian people and language. There are also other Greek sources that contradict the previous numbers of the Macedonians in Greece. The Athenian newspaper, "Message d' Aten" wrote on February 15, 1913, that the number of "Bulgar-echarhists" was 199,590 contradicting with those 119,000 of the "Ethnic Map of Greek Macedonia". "The Greek government must not complain that we are pointing to the fact that the Macedonian population of West Macedonia - 250,000 - 300,000 - is the most unfortunate national and linguistic minority in the world, not only because their personal safety in endangered, but also because they have no church nor school in their own language, and they had them during the Turkish rule." The speculations with the real number of Macedonians is obvious again. Their true number remains disputable in the Balkan documents, same as it was the case before the partition of 1912. Unfortunately, the Greek government would not allow anybody, including neutral observers to conduct statistical studies. Forced to leave, the Macedonians emigrated in large numbers to Australia, Canada, and the USA. As a result, there are about 300,000 Macedonians that presently live in Australia. In the city of Toronto, Canada, there are about 100,000. The present Macedonian colonies in these counties are represented mostly by the descendants of those Aegean Macedonians who settled there in the 1920's. According to the "Ethnic Map of Greek Macedonia Showing the Ratio Between Various Ethnic Elements in 1912 and 1926", only 42,000 left their homes. If we take the statistical tables of the Balkan and neutral sources above, by 1913 in the whole of Macedonia lived around 1,250,000 Macedonians. In the Aegean part (51%) which Greece took after 1913, half of the Macedonian nation remained under Greek rule - that would be 625,000 people. If up to 1926 42,000 out of these 625,000 left, in the Greek part of Macedonian thereafter remained 583,000 Macedonians. After World War I and under the international law, Greece signed the agreement to provide education in the languages of the minorities that remained in its borders. As a result, Sakerlarou Press in Athens printed a primer in the Macedonian language called "Abecedar" in 1924. It was intended for the Macedonian children in the soon to be opened new schools and it was a clear recognition of the existence of the Macedonians in Greece. The Greek government, however, later changed its position and the primer never reached the schools. "All residents from two to fifty years of age are forbidden to use any other language but Greek. I direct special attention to the youth. Anyone to break this law will be punished." 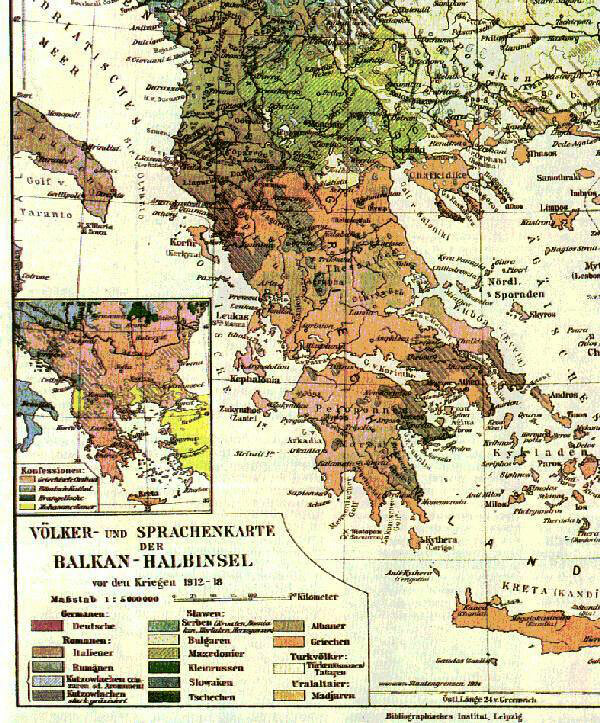 The Macedonians on this map (Mazedonier in German, and presented in green with stripes), populate the largest area of Aegean Macedonia, including the cities of Kostur (Kastoria), Lerin (Florina), Voden (Edessa), Ber (Veroia), and Salonika (Thessaloniki), the largest Macedonian city. This map is yet another clear proof that the Macedonians do exist as large minority in Greece. It is also very important to note, that southernmost river in Macedonia which many ethnographers consider to be Macedonia's border with Greece, is labeled on this map with the native Macedonian name Wistritza (Bistrica). However, Greek maps that date after the partition of Macedonia, have changed this name with the Greek Aliakmon. Another examples on wiping off the native Macedonian names from this map, would also be the second largest city in Aegean Macedonia, Serres which Greece changed to Serrai later, the river Mesta which was changed to Nestos, or the lake Beschik which today appears as Volvi. The CIA Ethnic Map of Balkans and Macedonia is yet another proof that the ethnic Macedonians today represent a big national minority in northern Greece or Aegean Macedonia. According to this CIA source, the Macedonians live in all parts of Macedonia: today's Republic of Macedonia, Pirin Macedonia in Bulgaria, and Aegean Macedonia in Greece. Following are several documents regarding the oppression of the Macedonians in Aegean Macedonia before the World War II. They appeared in "Rizospastis", a newspaper published by the Greek Communist Party (KKE). Serres (Serrai). The town square was covered with leaflets with revolutionary proclamations calling upon the soldiers to straggle for a solution to their problems and against the beastly reign of terror. Officers imprisoned the soldiers who read the leaflets... The most barbarous methods were used against us Macedonians, soldiers of the 6th Heavy Artillery Regiment. The majority of us are illiterate, we do not know Greek and therefore we frequently do not understand their orders. The officers tried to teach us to read and write, but their efforts were abandoned too soon and were performed so improperly than none of us learned anything. Lerin (Florina). It has been some time now that the whole bourgeois press launched a campaign against the Macedonian people. It represents a part of the fascist and military measures which the Government of Tsaldaris carries out in its orientation towards an increasingly brutal oppression of the people's masses in Macedonia. The Chief of the Security Forces here, Karamaunas, whenever he meets us on the streets threatens us with the words: "You are Bulgarians and if by any chance I discover any sort of organized movement, I will beat you without mercy and than I will deport you." We Macedonians should rise with greater courage and by means of increased activities should reject this campaign because it brings us an even more brutal oppression, starvation, misery, and war. The end of World War II brought both joy and sadness to the Macedonian people. Joy because the Macedonians were finally recognized as a distinct people with their own nationality, language, and culture in Yugoslavia. The Republic of Macedonia was not anymore "Southern Serbia" but an integral part of federal Yugoslavia. The possible unification of all three parts of Macedonia failed however as Great Britain intervened and blocked that idea, afraid that the Macedonian unification will endanger her interests on the Balkan peninsula. During the Greek Civil War that followed World War II, the Macedonians of Aegean Macedonia fought on the side of the Greek Communist Party (KKE) who promised them their rights after the war. After two years of KKE's success in the civil war, the United States decided to side up against them, afraid that Greece would become another communist country. With the military support that came from the United States and Great Britain, the communists lost the war, and the Macedonians once again did not get their human rights. In the years following the war, Yugoslavia urged Greece many times to recognize the Macedonian minority in Aegean Macedonia. The Greek paper "Elefteros Tipos" wrote that in September of 1986 the Prime-Minister Papandreu in the talks with Yugoslav presidency member Stane Dolanc has agreed to recognize the Macedonian language as one of the official languages in Yugoslavia. As a result of those talks, on March 16, 1988, the Greek Prime-Minister Papandreu and the Foreign Affairs' Karolos Papulias, even agreed to recognize the Macedonian language in Greece. However, the bankers affair "Koskotas" emerged, the PASOK government fell, and the documents were never signed. Greece continued to refer to the Macedonians as "Slavophones" who speak an idiom. "The Republic of Macedonia cares for the statue and rights of those persons belonging to the Macedonian people in neighboring countries, as well as Macedonian ex-parties, assists their cultural development and promotes links with them." Athens sees Article 49 to be a direct threat for the security of Greece because Macedonia cares for the people in Greece who consider themselves Macedonians? How can a country of two million be a danger to Greece's ten million? Furthermore, Greece has also similar article in her Constitution, as any other country in the world, to care for her minorities in the neighboring countries. Should Albania, Bulgaria, and Turkey, urge the world not to recognize Greece because of her Constitution to care for her minorities in these neighboring countries? What Greece is doing is against the international law. Greece demands that Macedonia change its Constitution because there are "no Macedonian people" in Greece but this will be proven to be a lie once again, when Human Rights Watch / Helsinki, visited Aegean Macedonia in 1994. Greece slapped a trade embargo on Macedonia because of the refusal of the Macedonian President Gligorov to rename the country, nation, and language, and change the constitution.The embargo had devastating impact on Macedonia's economy. Macedonia was cut-off from the port of Salonika and became landlocked because of the UN embargo on Yugoslavia to the north, and the Greek embargo to the south. Greece said it will remove the embargo only if Macedonia satisfies her demands. This blackmail was not acceptable to the Republic of Macedonia which considered the embargo illegal. At the same time, Greece withdrew from the Greek - Macedonian talks, monitored by the UN as a mediator, and blocked any acceptance of Macedonia in the international institutions by using its power to veto new members. The claims put forward by Greece that the ancient Macedonians were Greeks, that their native language was Greek, and that Macedonia had always been a region of Greece are all false. The historical truth is that Greece was inhabited by ancient Greeks, Macedonia by ancient Macedonians. Today, it is the modern Greeks and the modern Macedonians to occupy those lands. It is a total absurdity to hear the Greeks of today to claim they are the Macedonians, the Greek Macedonians, the only and true Macedonians. How can they be "the only and true Macedonians", when today's Greek population of Aegean Macedonia immigrated there just 80 years ago joining that small Greek minority of 10%? How can they overlook the atrocities they committed on the people who than, as centuries before, proudly called themselves Macedonians? What about the statistics and maps made by neutral and independent ethnographers, slavists, and writers, to prove the existence of the Macedonian nation? And finally, what about the ethnic Macedonians whose discrimination by the official Greek government was witnessed by the independent Human Rights Watch / Helsinki and Amnesty International in 1994? The existence of the Macedonian nation and the ethnic Macedonian minority in Greece can not be questioned. There is, however, a great deal of irony surrounding the issue. In spite of the truth about Macedonia and the Macedonians, many Western countries have not yet recognized the Republic of Macedonia under its constitutional name but under the reference "Former Yugoslav Republic of Macedonia". This includes the United States which after the recognition, did not send an ambassador to Skopje for more than a year. Interestingly enough, this "freeze" coincides with the visit of the most powerful representatives of the Greek-American lobby to President Clinton in the White House, behind closed doors, and in the presence of Clinton's adviser George Stefanopoulos, who himself, is a Greek-American. How it is possible that the Western countries have chosen to follow "democratic" Greece where lies prevail over the truth? The European Court found the Greek embargo illegal and put Greece on trial, but did nothing to stop it while it was so harmful to the Macedonian economy. They never cared about the rights of the Macedonians in Greece while the Macedonians of the Aegean are still facing daily oppression and persecution. Finally, they still play that game for the Macedonia's name, the way Greece wants them to. Yes, this is yet anotherproof that interests are stronger than the truth. Greece is a member of the European Union, NATO, an important ally that occupies a very strategic position. On the other hand, all other countries that do not belong to those organizations have recognized Macedonia under its constitutional name. Russia and China are among those countries. The question now is if the West is willing to risk losing Greece for the small landlocked Macedonia? But by standing silent on the issue, they are taking an active role in Greece's politics. Yet, on every atlas (like National Geographic), encyclopedia (like Britannica), newspaper (like New York Times), and TV media (like CNN), Macedonia is referred simply as Macedonia. Even the US Secretary of State Warren Christopher, and Defense Secretary William Perry, speak of Macedonians and refer to Macedonia as Macedonia. Matthew Nimitz, the US mediator in the Greek - Macedonian talks has said that "the country has an Constitutional name - Republic of Macedonia" and that besides the opposing of Greece, Macedonia was admitted at UN under the reference "former Yugoslav Republic of Macedonia", but that is "only a reference and not name". The truth about Macedonia slowly but surely is coming to the top, working towards a final end to the century-old shadow of Greek lies and propaganda. That is until the change of the Balkan policies and interests might push it all back to where it started. But regardless of everything, the Macedonians continue to exits on every part of divided Macedonia - the Republic of Macedonia, and the Macedonian parts which are today held by Greece and Bulgaria. They have survived as Macedonians for almost 3,000 years and nobody by renaming them will change the fact that they are and will remain Macedonians. 1. Karl Hron. Das Volksthum der Slaven Makedoniens. Wien, 1890. 2. P. Draganov. Makedonski Slavjanski Sbornik. St. Petersburg, 1894. 4. Dr. Cleonthes Nikolaides. Macedonien, die gesschichtliche Entwickelung der makedonischen Frage in Alterthum und in die neuren Zeit. Berlin, 1899. 5. Newspaper The Times, London. Saturaday, February 6, 1897 edition. 6. K. Gersin. Macedonian und das Turkische Problem. Wien, 1903. 7. Dr. K. Ostreich. Die Bevolkerung von Makedonien. Leipzig, 1905. 8. Dr. Karl Peucher. Statistische Angaben. Die Volker Macedoniens und Altserbiens. 1905. 9. Henry N. Brailsford. Macedonia, its Races and their Future. London, Metheuen and Co, first published in 1906. 10. Volker und Sprachenkarte der Balkan - Halbinsel vor den Krigen 1912-18. Bibliographisches Institut, Leipzig. 11. Newspaper Message d' Aten. Athens, February 15, 1913. 12. Carnegie Endowment for International Peace Report of the International Commision to Inquire the Causes and Conduct of the Balkan Wars. Washington, 1914. 13. R.G.D. Laffan. The Serbs. New York, 1917. 14. League of the Nations. Ethnic Map of Greek Macedonia Showing the Ratio Between Various Ethnic Elements in 1912 and 1926. Lausanne, 1926. 15. Newspaper Politika. Edition 6369. Belgrade, January 5, 1926. 16. Andrew Roussos. The British Foreign Office and Macedonian National Identity 1918 - 1941. 17. Newspaper Rizospastis, ar.195 (7132), 4/12/34, p.3 and ar.89 (7026), 6/10/34, p.3 and ar.87, (7024), 6/8/34, p.1. 19. Elisabeth Barker. 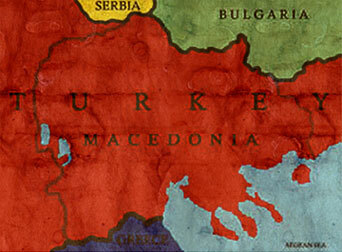 Macedonia - Its Place in Balkan Power Politics. London, 1950. 20. Spoljnopoliticka Dokumentacija No 36. Belgrade, 1951. 21. Lazar Moysov. Macedonians in Aegean Macedonia. Skopje, 1953. 22. Hammond Incorporated. The Times Atlas of World History. Maplewood NJ, 1989. Copyright Times Books Limited, London. 23. Stoyan Prebicevich. Macedonia, Its People and History. The Pennsylvania State University Press, 1982. 24. Jacques Bacid, Ph.D. Macedonia Through the Ages. Columbia University, 1983. 25. Quantis Curtius Rufus. History of Alexander the Great of Macedon, VI. Harmondsworth, 1984. 26. Rand McNally and Co. Inc. The Random House Encyclopedia Random House, New York, 1990. 27. Jackson J. Spielvogel. Western CivilizationThe Pennsylvania State University, West Publishing Company, 1991. 28. Human Rights Watch / Helsinki. Denying Ethnic Identity - Macedonians of Greece, New York, 1994. 29. Newspaper Elefteros Tipos. Athens, September 20, 1994. 30. The Constitution of the Republic of Macedonia.